The sorbet needs about 6 hours freezing, so it's best to make it a day ahead. Liquidise the melon with the lemon or lime juice and ginger until perfectly smooth. Add water to make up 600ml. Add sugar to taste (be generous, it will taste less sweet when frozen). 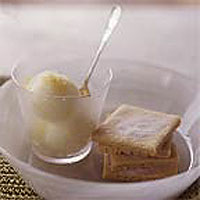 If using an ice cream-maker, whisk the egg white into the melon mix and freeze according to instructions. Otherwise, tip the melon mixture into a plastic container and put in the freezer. Remove when ice crystals have formed (3-4 hours) and whizz with the egg white in a processor before refreezing until solid. Sieve the flour and ground ginger into a bowl. Mix in the almonds. In a separate bowl, beat the butter and sugar until pale and creamy. Work in the flour mix to form a ball of softish dough (you may need a little extra flour). Pat the dough out on a baking tray into a 15cm round. Smooth with a rolling pin. Mark into wedges and prick lightly with a fork. Alternatively, roll into a square and mark into smaller squares with a knife (cut the biscuits when just baked and still soft). Bake for 40-45 minutes until pale gold. Leave for 2 minutes, then transfer to a cooling rack. They can be stored in an airtight tin for 3-4 weeks.